A bit ago I posted a review of Oilatum shampoo. It's been the best thing I have found for my scalp in that it doesn't make my head itch as soon as I've used it. But I still did get a little build-up on my scalp, like cradle cap, a day or two after washing my hair. 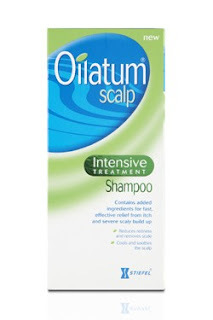 Anyway, when I ran out of my Oilatum shampoo I went to Boots to get some more and thought that I would try the Oilatum scalp intensive treatment shampoo instead in the hope that it would get rid of any cradle cap stuff altogether. Unfortunately it hasn't had the desired effect. The intensive treatment shampoo has menthol in, which does feel nice and cooling on your scalp, but the cradle cap returns worse than ever the next day. I've never really had dandruff but this stuff is awful - especially as I wear a lot of black. You can pick at it with your nails (urgh), but apparently you shouldn't do this as you can make your hair fall out. Eek! I am from South Africa and also have quite a sensitive scalp. My scalp eczema seems to be caused by skin allergies. I discovered a german shampoo called Linola. It is a bit expensive in my country as it is imported, and it looks like it is no longer being imported now, but you should be able to find it at a more reasonable price on your continent. The anti-dandruff shampoos just make things worse for me as most of the ingredients are really harsh (i also can't use normal body soaps, so I steer clear of all perfumes and colourants). The other thing to try (and this might sound really odd, i know..): Go to a south african speciality shop and buy some Rooibos (literally Red Bush) tea. After washing your hair, rinse with rooibos tea. Just make a pot of tea that you leave to draw while washing your hair, pour it in your basin and add enough cold water to make the temperature comfortable and plunge your head in it. This is really soothing for eczema, and usually clears up my break outs within a week or two. You can also use this to rinse your face. Rooibos is very high in anti-oxidants, and has been clinically proven to help with skin allergies. You can also drink it with milk and sugar or honey - it contains no caffeine and is very healthy. Lastly: Buy a bottle of pure glycerine (we have a brand name Dolly Varden available here, but any pure one will do). It is dirt cheap. Glycerine has been proven to combat eczema, and really helps with the itchy dryness associated. You are also very unlikely to be allergic to it. Thanks so much for your comment - I will look into the shampoo and the tea rinse :) How do you use the glycerine?